Zelda Breath of the Wild has more than a hundred shrines for you to find in its wonderful world. These are important because completing them gives you Spirit Orbs that you can exchange for additional hearth containers or bonus stamina (four spirit orbs for one health or stamina upgrade), and after completing all 120 shrines you’ll get Green Tunic of the Wild. By now you probably figured out that you can use your Sheikah Slate radar feature to locate shrines once you get close to them. While adventuring through Hyrule I came across a bird man named Kass playing his accordion (or is it a concertina?) and he offered me a side quest with a riddle to solve. To my surprise, solving the riddle revealed a secret shrine. These shrines do not register on your Sheikah Slate’s radar, which makes them very special. If you are a completionist like me you will want to find all of them as well. In this guide we’ll show you location of Kass, solution to his riddles and puzzles and discuss shortly what you can find in each shrine and perhaps how to solve it. UPDATE: While doing Under a Red Moon Shrine Quest I found Kass on top of mushroom looking trees. There is also a hut there containing his diary. In it I found a list of all the songs that he researches and what follows are guides for each of the songs in his research. All but one reveal hidden shrines. After I completed all he dissapeared from all the spots in the world he was previously at. I am hoping to come across him one last time in my trek through Hyrule. For whatever reason I was stumped by this beast with crown of bone thing. Not until I saw them grazing nearby did I figure out it is a deer buck I am looking for (I also found out that I am slightly retarded for not thinking of that sooner). So, your goal is to find a buck, sneak up on him and press A to mount him when you are close enough and the game gives you a prompt to do so. I found it much easier to sneak up on them if you wear all stealth enhancing armor or eat some food with that property. It takes almost a full stamina bar to tame him. Once you do that go back to Kass on your newly acquired mount and stand on the glowing platform next to him. This should reveal the Mezza Lo shrine. Map shows where to get the Crowned Beast Quest and find the secret shrine. Using stealth approach a buck nearby and mount it. Ride it to the platform to unlock the shrine. Puzzle inside Mezza Lo is called Ancient Trifecta. To the right of where you enter is a cube you can control with magnetism. Move it to reveal a laser that will hit the switch object. You can move the cube so that you can glide onto it and jump from it onto the platform with the chest to get Thunderblade sword; Magical sword with 22 damage that electrocutes enemies once it charges up and shines with a golden light. Now go back to the switch object and hit it with the sword and this should raise the platform next to the locked gate that takes you to the Spirit Orb guy. Once this happens move the cube so you can reach the newly raised platform. Once on it move the cube and drop it onto the switch in an enclosed area right of the locked gate. This should open the gate and complete the shrine. First move the cube with Magnetism to free the laser beam. Hit the object the laser activated to raise the platform and use the cube to reach it. Move the cube and drop it onto the switch that opens the last door. Once you see lightning sparks showing up on Link drop your weapon. If the sparks do not transfer onto the weapon try opening your weapon inventory (hold right dpad) and choose remove again. Once the sparks are on the weapon on the ground run away as fast as you can. Enter the shrine and there is no puzzle to solve. You get Rubber Tights – part of the Rubber shock resistance armor set and an easy spirit orb. Kass starts another secret Shrine Quest. Wing of cloth and wood must be your paraglider and it seems you have to land on the altar shown during the quest cutscene. Now, just to figure out how to land there. There is a rock formation south of Kass that has winds blowing in various directions. If you climb it you should see four different breakable rock formations nearby. The puzzle solution is to create a wind stream blowing towards your goal. I advise you to use your bomb rune and destroy all the rock formations. This will let loose the winds they were blocking and create a central stream of air blowing towards the altar. Now, climb the rock formation and jump off of it and glide into the central stream. You need to do this from above, because you need the heights to be able to reach and land on the altar. This should unlock access to the secret shrine. Inside the shrine there are no puzzles and you can just pick up your Great Flameblade – high damage sword that sends out a fireball once charged. From the tower’s shadow an arrow flies. As sammy t pointed out in the comments you want to wait for the sun or the moon to reach the northwest and its shadow should point to the altar you need to activate. If you look southeast from the tower you will see the altar. Glide down to it and stand on it. All you have to do now is wait for either the sun or the moon to reach the right position. Altar will start to glow and I waited until the moon aligned with the tower exactly and shot an arrow in its direction. This unlocked the shrine. Inside the shrine you will have to defeat a guardian and as reward you get the Frostblade and spirit orb. As the sun or the moon move across the sky they cast a shadow that will move across the landscape. This activates the altar. Your best bet is to stand on the altar and shoot at the sun or the moon once they are aligned with the top of the tower. Riddle is pretty self explanatory. The trick is finding two stone formations that align for you to take a shot through them. Quest’s cutscene is misleading, showing some stones that won’t align. Refer to the screenshot to see the exact location of where I stood to make the shot and reveal Sheem Dagoze Shrine. You have to wait for the Blood Moon to rise. How to guess when the Blood Moon rises? I tried lighting a campfire sitting at it for 5 nights in a row, but I had no luck. Blood moon rises at midnight, but I am not sure if it is on a random night or just enough days have to pass. In any case, my suggestion is that you play the game and the moment you see a blood moon event happening you load an autosave and teleport immediately somewhere close to Kass’ location and wait for the event at the pedestal. There is also a guy at Dueling Peaks Stable named Hino that tells which phase the moon is in every night and also says whether the blood moon will come up that night. You can make a campfire at his location until he says that the bloodmoon will come up that night. As soon as it is nightfall (21:00) the pedestal will start to glow. All you need to do now is stand on it with all items removed (head, chest, leg armor, weapon, shield, bow) and this will reveal the shrine. Go back to the pedestal and as soon as the night falls (21:00 in-game time as seen on the screenshot) it will start to glow. Stand without gear on it to complete the quest. Kass is in Pagos Woods, east of Hylia Lake, in the Faron region. His song is an easy riddle to solve, but the hard part comes afterwards. Looking at the map you will clearly see a river that looks like serpent’s jaws, to the north of your current position. Go there and you will come across a tribe of enemies. You can actually run past all of them going towards the northernmost part of their settlement. You will find a Spring of Courage with a blessing statue there. It tells you that you need to offer Farosh’s Scale to unlock the shrine. After you take the quest go north, avoid village of enemies and reach the skull marked point on the map. Pray at the shrine to continue quest. Farosh is one of the dragon spirits that appear in Hyrule. He spawns at Lake Hylia at midnight (his head appears out of the lake at 00:10 in-game time for me). He makes flight towards the eastern hill and makes a u-turn towards the Bridge of Hylia. I stood on top of the southern gate of the bridge. There are two towers on top of the gate and I stood on the western one (looks a bit broken). You need to shoot the dragon’s body with any of your arrows (if you hit the mouth, horn, claw you will not get the scale). Shoot a bit above him and you should be able to do it. Alternatively you can glide on top of the updraft he creates and if you aim your bow mid flight time will slow down and you can make a perfect shot. This drains stamina extremely fast so have stamina replenishing food or elixirs ready. The scale dropped for me in the water. I swam to it and picked it up. Farosh spawns at midnight game time at the location showed on the screenshot above. Now go back to the Spring of Courage and drop the scale into the water. This will unlock the shrine, inside which you will find a Thunderspear. This is a special Kass quest, since there is no shrine involved. You need to wait until 17:00 game time and the shadow of the pillar Kass is on will show the location of a hidden treasure chest. Inside it you will find 300 rupees and also complete the last Kass quest. 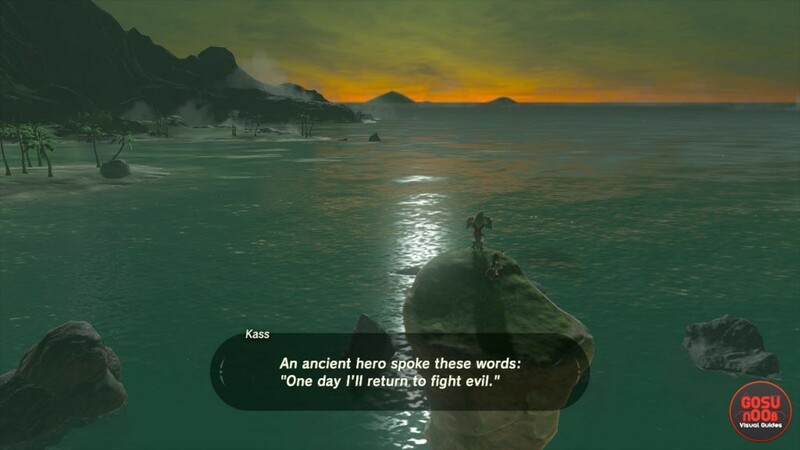 Find Kass in Kitano Bay in eastern Hyrule. At 17:00 game time (that is 5pm) the shadow from the stone pillar will point at the location of the treasure. Use Magnetism to fish it out. I hope this guide helped you when you got stuck during one of the more fascinating quest chains in Zelda Breath of the Wild. I would like to thank all the people that commented and left tips. Without you this guide would not have been what it is. I’ve updated the guide and I hope the screenshots help. Thank you – credited you in the guide. You can also shoot the moon if it’s night. The clue says “Shoot the heavenly light” or something like that. The sun and the moon are both heavenly bodies that appear to emit light. Can we investigate the hidden shine over near the rito tower? I can’t seem to figure it out, every day at noon and midnight the sun and Moon light a heart shaped shadow that passes over the shrine, Im stuck beyond that point tho. Light a torch and hold it against the middle of the shrine mound while it’s glowing. There’s another one in the Gerudo region. It’s A mountain located to the South, and it’s literally the ONLY snowing mountain peak in the Gerudo region. Mount Ganajh has a little destroyed shed, with a diary, South of that is another peak, with a Sheik Pedestal. The Pedestal glows around 5:00PM in game time, you have to make a snowball big enough to cast a shadow onto the Pedestal. You do this by rolling the snowball on the hill, making it collect snow and making it land on a small pond. Make sure it’s on the smaller, round pound, and not the big long one. You can also just use Cryonisis power. Alternatively for mezza lo , you use magnet power to move block onto the switch and leave it there. Move the sliding block back to the station where the crystal is, leave a bomb next to the crystal, change powers and use the slow time on the laser, get onto the moving block before the laser come back on, get sword, use arrow to shoot crystal and move block while standing on it, now in the position where the block is on the switch, change powers to bomb and detonate, this will then move you to the final room, all while riding the moving block. I found one near the flat trees on a small mountain range south west of the plateau. Can’t quite remember the riddle but it required link to be bare to the blood moon. Basically removing all clothes and weapons and standing on the little platform during a blood moon makes a new shrine appear. There is a Kass quest called “Under a Red Moon” for a Shrine. There is a hilltop like area called Washa’s Bluff (Northwest of Satori Mountain [which has Mogg Latan shrine on it.]) where Kass is playing his accordion on top of those mushroom-like figures. The quest line states, “When the moon bleeds and the fiends are reborn / The monks will invite you as they have sworn. But first you must stand on the pedestal bare / With nothing between you and the night air.” I haven’t completed it because I assume Blood Moon is what is needed, and I JUST had a Blood Moon prior to getting to that spot. I haven’t found this on any other website or guide and yours is my favorite so I figure I’d try letting you know. If you do have this listed here or somewhere else then sorry but I think I gave a big enough look. I hope this helps. Can you make a guide about where to get allyhe Shrine quests and how to solve them? Please! Go around the map and kill a lot of bigger mini bosses. A quick guardian run in Hyrule Castle and some Hinox kills will ensure you’ll eventually get the blood moon. If you suspect you’ve killed enough enemies and it’s getting close to midnight, warp to a nearby shrine and get ready. If it doesn’t happen, go back to killing enemies as you would until night time comes and try again. I say this because I had SO much trouble using up all of my wood/flint/fire arrows passing the time until I saw the moon wax, wane, and become full. IT ISN’T ENOUGH TO WAIT FOR A BLOOD MOON. YOU HAVE TO RACK UP A LOT OF KILLS IN ORDER FOR THE BLOOD MOON TO OCCUR. I am not sure this is necessarily true. I had blood moon happen even if I didn’t kill a lot of stuff. This needs testing. I’ve cleared out almost all of the Hyrule Castle enemies and everything around the “Under A Red Moon” shrine area and still can get the blood moon to activate. Like.. it’s the last shrine I need, I’m tearing up enemies and checking with the moon guy at dieling peaks stable and ive probably gone through a month of in-game time and nothings working for me. Is there ANY way of forcing an activation? Cannot* get it to activate. killing enemies has nothing to do with blood moons. even if there’s a full moon in the game, you need to have played almost 3 hours from the last blood moon. For the quest to get the lightening to strike the mound, you can also drop a metal weapon there and just jump off the mound. Once lightening strikes it and the shrine is revealed, you can just pick you weapon up. After you complete the quests, Kass will go to Rito village on the platform with the sisters. Lighting a camp fire works to get blood moon you only have to wait a few mins. Impossible to see where it is on the map if your playing the game in a different language! Hi, I’ve done all these quest and checked in my shrine quest logbook to make sure they all say completed. They also have (! )Kass under the title so I know for sure I talked to Kass before starting the quest, or else it would say (!)???. I also did Rito Village Quest: Find Kheel & Recital at Wabler’s Nest. The kids are back at the village singing by the shrine. However, Kass STILL hasn’t shown up. What is going on? I’ve done everything. I have all 120 shrines completed as well. It seems like I missed something. I forgot to talk to him somewhere? How can that be? Nvm. I FINALLY figured it out. When doing the Kass Shrine Quest “under the red moon”, you have to read the entire book as well. You can’t just start the quest and finish the shrine. You have to read the book or else Kass won’t return to the village even after everything is done. I’ve read the diary during and after the blood moon quest and Kass still doesn’t show up at Rito Village, I have no idea what I’m doing wrong. I got it to work, I didn’t talk to Kass at Gerudo Tower but once I went back there he was at Rito Village. I’ve completed all the quests but when I check it still shows 41 of 42 completed. The only quest not showing up is the labyrinth trial and I already completed it. Where is kass located at for this trial? Trav, Kass doesn’t give you the labyrinth trial quests. The Shrine Quests automatically begin once you land on the maze floor. By the way, maybe you just completed two out of three labyrinths. Thank you so much! This was so easy once I read about it! Thank you!